Did you know that opening a regular savings account at your bank may not be your best option when it comes to saving for college? You can get tax breaks and other benefits by opening an investment account specifically designed to let you save for college. There’s no denying it—it’s cheaper to save for college than it is to borrow money for college. 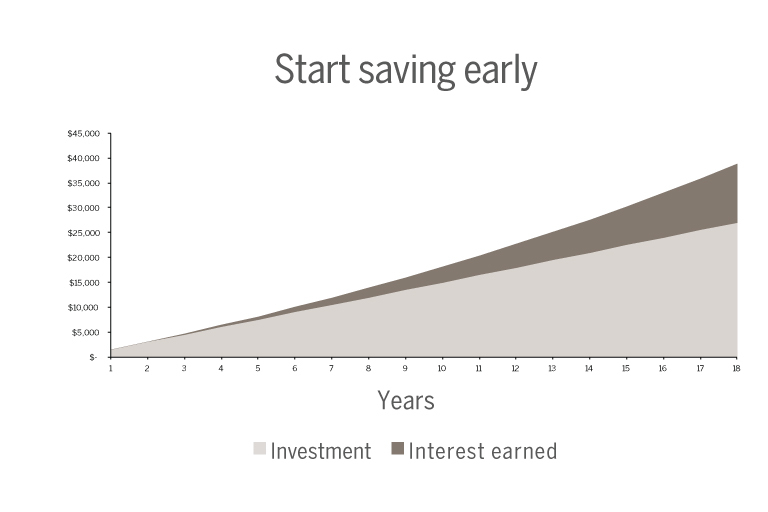 And the earlier you start, the more time your savings have to earn interest. The bottom line is that the more you plan and the more you save, the more options your child will have. The graph on this page shows how your return on an investment of $125 a month can add up over 18 years. But even saving $25 a month can get you started. New parents start a 529 plan as soon as they can after their child is born. They invest $125 a month for 18 years with an annual return rate of 4 percent. By the time their child is ready for college, the plan’s value is just under $40,000. Another set of parents start a 529 plan at the same time. They invest $25 a month for 18 years with an annual return rate of 4 percent. By the time their child is ready for college, the plan’s value is just under $8,000. Savings plans should be only part of your strategy for paying for college. Think of college savings as a way to supplement financial aid, and don’t be discouraged if you’re unable to fully cover the cost of an education with your savings. Remember, every little bit helps—even if your child is in high school when you open a plan. No matter when you start or how much you’re able to save, you’ll be building a solid foundation for a college education. Want to learn more about your options when it comes to paying for college? The Consumer Financial Protection Bureau can help you make informed decisions about financial aid. The College Savings Plans Network offers a lot of good information about saving for college. The College Board offers comprehensive information about paying for college, including tools and calculators to help you figure out how much you’ll need to save. Estimate what college will cost for your child.